Do I have to take the class to close on my loan? How long is the certification effective for a mortgage application? How do I become a Homebuyer Education Trainer? My home is being foreclosed on. Can you help? What if I am not in foreclosure yet? What is the Emergency Solutions Grant Program? How does a financial institution receive the tax credit? What are eligible housing entities? What is the Emergency Repair Program (ERP)? What is the HTF Competitive Grants Program? What is the Housing Modification and Ramp Program? What is the Rebuild and Recover Disaster Grant Program? How do I check the waiting list? How do I find a place to use my voucher? What is Family Self Sufficiency (FSS)? Do you have to be on Section 8? What are Low Income Housing Tax Credits? How do I get tax credits? How can I get the THDA Board of Directors to consider different guidelines? What is the Project-Based Contract Administration Program? Where are these properties located? What does the Program Compliance Division do? What properties does Program Compliance monitor? Where can I find the most up-to-date HUD forms? How do I file a complaint if I believe I have been discriminated against in housing? How do I file a complaint against banks, trust companies, credit unions, industrial loans and thrift offices, insurance premium finance companies, mortgage companies, check cashers, deferred presentment service companies, title pledge lenders and money transmitters? The interest rates vary from time to time. To view the most current available interest rate click here. THDA’s business development director is always making new contacts and training new lenders to do THDA loans. You can find a full list of approved lenders by clicking here. THDA’s business development director works with area Realtors® across the state to provide THDA mortgage training. The first step in finding a home would be establishing a relationship with a Realtor®. Click here to find a list of THDA-trained Realtors®. THDA borrowers qualify for a THDA mortgage based on two requirements: income limits and acquisition limits. Both numbers are a determining factor on how much home you can purchase and these figures can vary from county to county. To find out what the income limits are in your county click here. To find out what the acquisition limits are in your county click here. 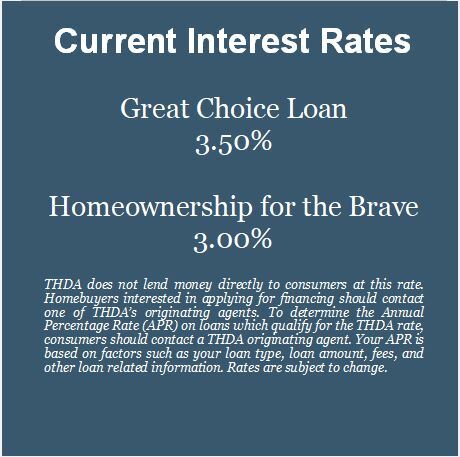 THDA requires homebuyer education for the Great Choice Plus and the Homeownership of the Brave Loan Program applicants and encourages it for everyone considering homeownership. THDA’s purpose not only is to assist people with purchasing homes, but also to help them become long-term, successful homeowners. THDA’s approved trainers offer inexpensive classes; some trainers return the cost upon class completion. You can find a class near you by clicking here. Once the class has been completed, the certification is good for one year. If you are interested in becoming a Homebuyer Education Trainer, you can locate and contact one of THDA’s certified trainers for details by clicking here. You can contact one of THDA’s certified foreclosure prevention counselors to learn if you are a candidate for loan modification. To find an approved counselor click here. THDA has provides training and helps with administrative costs for nonprofit organizations to assist you in your struggles with your current loan. If contact is made before the foreclosure process has begun, the approved credit counselors can provide you with guidance on the steps you need to take to best resolve your situation. If necessary, these counselors can serve as mediators for you with your mortgage company, allowing you to avoid some of the frustrations that often come with making difficult decisions. If you are not in foreclosure, but know that you are reaching a point where you will no longer be able to make your mortgage payment, a credit counselor can offer guidance and options to assist in resolving your issues. Hopefully a loan modification will be an option, or if you have an adjustable rate mortgage and can qualify for a THDA loan, you can inquire through your local lender about refinancing with THDA. HOME is a federally-funded program administered by THDA to promote the production, preservation and rehabilitation of housing for households of low income. HOME funds are awarded annually through a competitive application process to cities, counties and non-profit organizations outside the local participating jurisdictions. Local Participating Jurisdictions (PJs) are those local governments in Tennessee that receive HOME funds directly from the US Dept of Housing and Urban Development. The Local PJs are Clarksville, Chattanooga, Jackson, Knoxville, Memphis, Nashville-Davidson County, Knox County, Shelby County, and the Northeast Tennessee/Virginia Consortium (Bristol, Kingsport, Johnson City, Bluff City, Sullivan County and Washington County). Eligible housing activities include homeowner rehabilitation, homeownership programs, and rental programs, including supportive housing development by non-profit agencies for individuals or families dealing with physical disabilities, mental illness or developmental disabilities. To become eligible for a HOME grant, a household must have an annual income at or below 80% of area median income as defined by the Section 8 Rental Assistance Program. The household must live within a community or county that has been awarded HOME funds or is served by a non-profit that has been awarded HOME funds. Each of the eligible housing activities has specific program requirements established by the HOME regulations. An individual would apply with the non-profit or the community that received the HOME grant. There is generally a public meeting to announce the program and set the procedures for receiving applications. To determine if there is a HOME grant in your area, contact THDA for information. The Emergency Solution Grant Program (ESG) is a federally-funded program administered by THDA to assist the homeless. The program helps improve the quality of existing emergency shelters; helps meet the costs of operating emergency shelters; provides street outreach to the homeless; and provides certain essential social services to the homeless so that they have access to supportive services. The program is also intended to decrease homelessness through the provision of preventive and rapid re-housing activities. ESG funds are awarded on a non-competitive basis to the Small City Entitlement Communities of Bristol, Clarksville, Cleveland, Franklin, Hendersonville, Jackson, Johnson City, Kingsport, Morristown, Murfreesboro, and Oak Ridge; and, on a competitive basis, to 501(c)(3) non-profit organizations outside the CDBG entitlement communities that receive their own ESG funding directly from the U. S. Department of Housing and Urban Development (HUD). The Tennessee communities that receive their own allocation of ESG funds from HUD are Chattanooga, Knoxville, Memphis and Nashville-Davidson County. Individuals or families must meet the federal definition of homelessness or at risk of homelessness to be assisted through the ESG program. For homeless prevention programs, participants must have an annual income at or below 30% of area median income as defined by the Section 8 Rental Assistance Program and have no other identifiable resources. Individuals apply directly to the emergency shelters and agencies funded by the ESG program. To determine if there are resources in your area, contact THDA for information. Financial institutions may obtain a credit against the sum total of taxes imposed by the Franchise and Excise Tax Laws when qualified loans, qualified investments, grants or contributions are extended to eligible housing entities for engaging in eligible low income housing activities. The amount of the credit can be applied one time based on the total amount of the loan, investment, grant, or contribution; or the credit may be applied annually for qualified loans and qualified low rate loans based on the unpaid principal balance of the loan. The amount of the credit can be either 3%, 5%, or 10% as determined by the Tennessee Department of Revenue. Activities that create or preserve affordable housing for Tennesseans of low income. Activities that assist Tennesseans of low income in obtaining safe and affordable housing. Activities that build the capacity of an eligible nonprofit organization to provide housing opportunities for Tennesseans of low income. Any other low-income housing related activity approved by the THDA Executive Director and the Commissioner of Revenue. The Low Income Home Energy Assistance Program (LIHEAP) is a federally-funded program administered by THDA to provide financial assistance to households of low income in their home energy costs. The LIHEAP funds are awarded to a network of 19 community service agencies serving all 95 counties in Tennessee. The program also allows for weatherization activities and intervention in energy crisis situations. To be eligible for LIHEAP assistance, the gross annual income of the household cannot exceed 150% of the federal poverty standards. Priority is given to households with elderly, disabled or young children and an energy burden for heating and cooling assistance. LIHEAP crisis assistance provides services to households which are subject to life-threatening conditions without immediate intervention to address critical energy-related needs. A household can only receive one type of LIHEAP assistance in a program year. Individuals apply directly to the community service agency serving the county in which they reside. Click here for a list of the LIHEAP agencies. The Emergency Repair Program (ERP) provides grants to low income, elderly homeowners to correct, repair, or replace an essential system and/or a critical structural problem. The purpose of the program is to stabilize the elderly homeowner’s residence by making rapid, essential repairs to make the home livable. This is not a comprehensive homeowner rehabilitation program. The applicant must be at least 60 years of age and must occupy the property to be repaired as her/her principal residence. The applicant must have an ownership interest in the property to be repaired. If the property to be repaired is a manufactured housing unit, it is not necessary for the elderly homeowner to own the manufactured unit and the land on which it sits; the elderly homeowner must, however, have title to the manufactured unit. The household income must be at or below 60% of area median income as defined by the Section 8 Rental Assistance Program. Click here for income determination. Click here for the income limits. The Emergency Repair Program is administered through Tennessee’s nine Development Districts. Click here to find the Development District that serves your area. The Housing Trust Competitive Grants address the housing needs of the very low-income, the very low income elderly and the very low income special needs populations of Tennessee. Local communities, non-profit agencies, human resource agencies, development districts, public housing authorities and other departments of state government are eligible to apply for the Competitive Grants. The eligible activities are rental housing programs (new construction; acquisition and/or rehabilitation, conversion) and homeownership programs (downpayment programs or development of units for homeownership). The Competitive Grants program requires a 50% match. The gross annual income of the tenant household must be at or below 80% of area median income as defined by the Section 8 Rental Assistance Program. Click here for income limits. An individual would apply with the non-profit or other entity that received the HTF Competitive Grant. To determine if there are HTF funds in your area, contact THDA for information. To determine if there are HTF funds in your area, contact THDA. The Housing Modification and Ramp Program (HMR) began as the Ramp Program in 1999 in partnership with United Cerebral Palsy of Middle Tennessee to ensure that no individual with a disability was confined to his/her residence because they could not afford a ramp. In 2010, the Ramp Program was expanded to include interior modifications for disabled households in addition to ramps for ingress and egress. The funds are awarded competitively every two years. United Cerebral Palsy was awarded the 2010 and the 2012 HMR grants, and the program operates on a state-wide basis through a network of partner agencies. HMR requires a 50% match for the THDA funds. The disabled individuals must have gross annual income at or below 80% of area median income. The program serves both owner-occupied and tenant households. An individual would contact United Cerebral Palsy of Middle Tennessee for the partner agency serving their area of residence. The Rebuild and Recover Disaster Grant Program is the newest program in the Housing Trust Fund and was approved by the THDA Board in March 2013 with an allocation of $2 million in THDA funds. The purpose of the program is to provide assistance to local communities impacted by a weather-related incident that does not rise to the level of a Presidential Disaster Declaration or a TEMA Declaration. The maximum grant to a community is $500,000. There is a 50% match requirement for the THDA funds. Rebuild and Recover serves owner-occupied households at or below 80% of area median income to rehabilitate their housing not covered by insurance or other disaster relief programs. The program can also be used to demolish damaged structures or to relocate an owner-occupant. In the event of a local disaster, the county or city mayor contacts THDA for an assessment of the damage, and the need for Rebuild and Recover. The Section 8 Housing Choice Voucher (HCV) program is a federally-funded program with limited funding. Applications are taken only when waiting lists are open and are completed online by online by clicking here. You can check your area’s waiting list by clicking here. THDA serves 72 counties across the state. We do not serve the larger metropolitan areas that receive their own vouchers such as: Davidson, Hamilton and Shelby counties. For a list of the counties served by THDA click here. THDA maintains a list of available apartments, duplexes and single-family homes that can be accessed through www.TNHousingSearch.org. This site is constantly changing due to rental units being added frequently. THDA does not have emergency shelter. For access to available emergency shelters in your area log onto www.TNHousingResource.org. This site is constantly changing due to resource options being added frequently. THDA staff works with HCV families to create step-by-step plans that lead to economic independence. The purpose of the FSS program is to facilitate access to the supportive services to assist families who want to become free of public assistance. To participate, you must be on the HCV program. All HCV families are eligible to participate in the FSS program. To learn more click here. The Low Income Housing Tax Credit Program is a credit against federal income tax liability each year for 10 years for owners and investors in low-income rental housing. The amount of tax credits is based on reasonable costs of development, as determined by THDA, and the number of qualified low-income units. To be eligible for tax credits, a development must have a minimum of either 20% of its units occupied by households with incomes no greater than 50% of area median income or 40% of its units occupied by households with incomes no greater than 60% of area median income. Income limits are adjusted for household size. Maximum rents are established for each size of unit, not to exceed 30% of the area maximum income for specified household sizes (utilities are considered part of rent if paid by the owner). All requirements of the relevant qualified allocation plan developed by THDA and approved by the Governor must also be met. To locate the most current version of the Qualified Allocated Plan click here. A draft of the Qualified Allocated Plan is posted each year in October. There are workshops held by the Multifamily division staff to discuss changes and allow developers and investors to make comments which are submitted to THDA’s Board of Directors for review before the final version is posted in January. To find a Board Member in your area click here. This is a performance based contract that THDA has with the US Department of Housing and Urban Development (HUD) for oversight of properties with Section 8 Housing Assistance Payment Contracts. The Section 8 Contract Administration Division is responsible for the majority of HUD's Performance Based Section 8 properties in Tennessee and is also a traditional contract administrator for a small portfolio of Performance Based Section 8 properties for which THDA is the mortgage holder. For more details about this program click here. There are properties available all across the state and you can locate them by clicking here and entering the county. Complaints should be filed by contacting THDA at 1-800-314-9320, Monday through Friday, 8 a.m. - 4:30 p.m. or sending an email. If you would like more detail about resident issues that cannot be processed by THDA, click here. THDA’s Program Compliance Division monitors properties that must commit to a compliance period to maintain funding levels. To learn more about the Program Compliance Division contact Gwen Coffey, Director of Section 8 Contract Administration and Compliance, at 615-815-2219. The Program Compliance Division monitors federally- funded programs such as HOME, Low Income Housing Tax Credits and the Project Based properties. For more details regarding the compliance monitoring for each of these programs click here. A list of properties that are currently being monitored can be provided to you by contacting Gwen Coffey, Director of Section 8 Contract Administration and Compliance, at 615-815-2219.
http://www.hud.gov - go to ‘A-Z Index’ in top right corner, go to ‘F’ and click on Forms. On both sites, the forms are searchable by form number. If you believe you have been discriminated against in housing you may file a complaint, at no cost, with your local Tennessee Human Rights Commission office. Complaints must be filed with the Commission within 180 days of the last discriminatory act. Complaint forms, office locations and a list of frequently asked questions may be located on the Tennessee Human Rights Commission website. If you would like to file a complaint against a financial institution, visit the Department of Financial Institutions website.